Pizza Punks opened in Newcastle during September. I dined as a guest of the restaurant, sampling a starter and one of the pizzas prepared within wood-fired oven of the open kitchen in the course of writing this review. Disclosure: Stuart Forster, the author of this article, was invited to dine at Pizza Punks and retained full editorial control of this post. Pizza Punks did not review or approve this feature. The restaurant, on Grey Street, is within Gainsborough House, about 100 metres down from the Theatre Royal. Prior to the opening of Pizza Punks, Café Rouge occupied the venue. The transformation has been radical. The space now has a hip, contemporary feel. It’s very much decor of the moment. Picture brickwork walls, a concrete floor plus industrial-style metal piping on the ceiling. The restaurant’s white pillars bear Pizza Punks’ anarchist-style logo; a ringed, hand-drawn capital ‘A’. There’s more elaborate graffiti-style artwork at the back of the room, near the steps down to the toilets. It is the company’s first restaurant in England, following openings in Glasgow and Belfast. Tearing a slice of pizza from the plate. A neon light glows orange in the hallway leading into the restaurant. 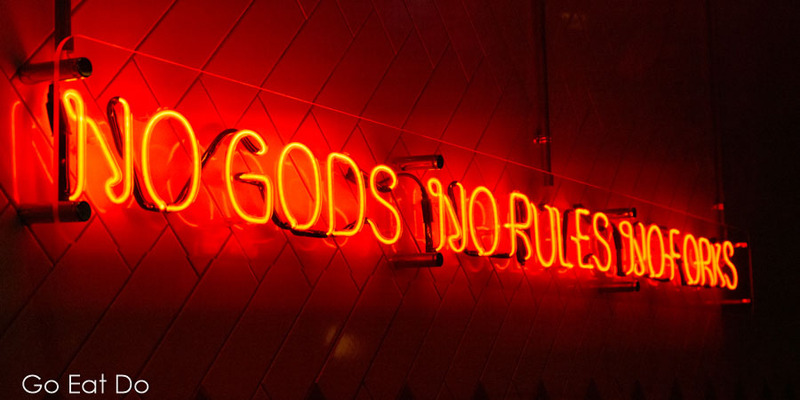 ‘NO GODS NO RULES NO FORKS,’ it proclaims in capitals. Good — I always did prefer eating pizza with my fingers. Cutlery is, of course, provided but I decided to help save on washing up by using my hands to pick up my pizza slices, even if that does tend to run the risk of drawing judging glances from fellow diners disapproving of me failing to use a knife and fork. Fortunately, Pizza Punks isn’t that kind of place. It has a distinctly laid-back vibe and draws clientele of mixed aged. Glancing around I noticed couples on dates, friends meeting for a chat over food and, on the banquette next to the open kitchen, a group of colleagues on an office night out. There’s a decent choice of cocktails, canned craft beers plus lager on tap. Approvingly, I noticed that rock music plays, but at a volume that doesn’t intrude on conversation. The staff wear black T-shirts. India, my smiling server, introduced herself to me and my companion, explaining that at Pizza Punks we’d be able to construct our own pizzas. How? Choose a base (sourdough or gluten-free), a sauce, the cheese, any number of toppings and, optionally, a dash of oregano, flaked chilli, basil or rocket to top the creation. The menu also listed a handful of popular pizzas, including a Margherita and one inspired by an English breakfast. By far the most spectacular is the Hot Punk, which is set alight as it’s served. Ideal if you’re into instagramming your food. A neon sign bearing the word ‘LUBRICATION’ glows behind the bar. Being a restaurant, though, there was no call for me to wander over there to place my order. India brought a tangy cherry pop soda with a lemony undertone and a zingy strawberry lemonade that caused me think of a non-alcoholic daiquiri. 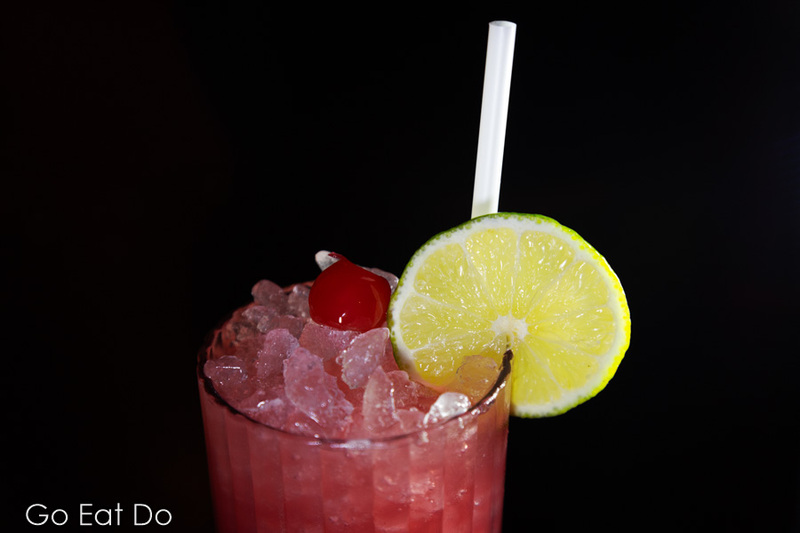 Cherry pop soda served with a wedge of lemon and a paper straw. Though scone-like in appearance, the texture of the sourdough cheeseburger bites that we ordered as one of our starters reminded me of the Tibetan cuisine that I enjoyed in the Himalayan foothills. Meaty, juicy and delicious, they were a joy to devour. Who cares about calories when something tastes good. Our pitted olives, though, were a tad disappointing. They lacked a dash of olive oil, a hint of garlic or a twist of lime; something, anything to enliven them and raise them out of the ordinary. After munching my way through three of the four sourdough cheeseburger bites I spotted cardboard boxes stacked on a shelving by the kitchen, alongside Pizza Punk baseball caps and T-shirts. Takeout was an option if slices of pizza remained at the end of our meal. Making a grab for one of the sourdough cheeseburger bits. From my seat I could stare directly into the domed pizza oven. Wood burned next to gas-fuelled yellow flames. For a while I stood to observe the team behind the counter shaping the dough then carefully placing the resultant pizzas in the arched doorway of the oven. Wood and flames in the oven at Pizza Punks Newcastle. I ordered a pizza featuring Irn-Bru pulled pork, jalapenos, sun-dried tomatoes, black pudding and red onions, plus mozzarella cheese on a barbecue sauce-smeared sourdough base. My companion favoured the basil and garlic flavoured red sauce on sourdough, topped with Parma ham, chorizo, caramelized red onion and red pepper. Hand-pulled to a diameter of approximately 12 inches, both pizzas proved tasty with light bases. Despite being an unusual combination, the spiciness and other flavours of my creation were well-balanced. With a hoppy, floral Digital IPA from Yeastie Boys it went down well. All told, I enjoyed my visit to Pizza Punks. The pizzas proved good and are modestly priced. There’s a high probability I’ll be back. Pizza Punks Newcastle (tel. 0191 230 0777) is at 34-40 Grey Street, Newcastle upon Tyne, NE1 6AE. You can see the restaurant’s opening times and view the food and drinks menus online. Looking to experience more of the city after dining? See the NewcastleGateshead website for ideas about things to see and do in the city. Here’s a look at some of the attractions that you can explore by walking in Newcastle and Gateshead. Staying in Newcastle for more than one day? Here’s a look at a handful of other places to eat in Newcastle. Stuart Forster, the author of this post, lives in the north-east of England. He is available for freelance commissions and can be contacted via this website.